Discover every vibrant aspect of your personality with Colorstrology, a fascinating blend of astrology, numerology, and color theory that offers exciting new insights about our lives and relationships. 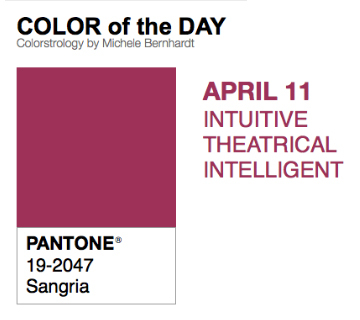 Written by renowned astrologer Michele Bernhardt using the numbers and color schemes of Pantone, Inc. This book also gives you inspiration when you can't decide on colors for your next event, such as color of the month and color of the day.